Most likely upon her engagement or some time shortly after, Princess Joséphine-Charlotte was gifted with a bracelet made of 258 brillants and a large central sapphire from Sri Lanka by the association. She chose to wear the design by Jean Lantonnois for her engagement ball in Brussels and many times after that. (Sidenote #1: I absolutely love the dress she wore for the ball. Sidenote #2: All the pieces of jewellery that then Hereditary Grand Duchess Joséphine-Charlotte wore in the picture on the right were wedding presents. In addition to the sapphire and diamond bracelet, she wears the Belgian Scroll Tiara, the Congo Diamond Necklace Tiara as a necklace with the accompanying bracelet as well as a pair of earrings given to her by the Belgian people through a national subscription.) The central part of the bracelet can also be worn as a brooch. Although I'm not entirely sure whether it was originally intended to be a convertible piece, the bracelet has also been worn as a tiara by Grand Duchess Joséphine-Charlotte and her two daughters, Archduchess Marie-Astrid and Princess Margaretha. Looking at the ladies above, it, however, doesn't seem to me as if the bracelet is put on a base like many other convertible bracelet and necklace tiaras but instead lies relatively flat on the head. Like basically all other personal jewels of Grand Duchess Joséphine-Charlotte, the sapphire bracelet was part of the proposed and cancelled auction in 2006. To the best of my knowledge, the bracelet hasn't been worn by Grand Duchess Maria Teresa since but instead seems to be the personal property of Princess Margaretha now. When her older brother came to Belgium for a state visit in 2007, Princess Margaretha and her husband Prince Nikolaus, who lived in the country at the time, were invited to join their family - the former King Albert II also being the brother of Grand Duchess Joséphine-Charlotte - for the gala dinner. 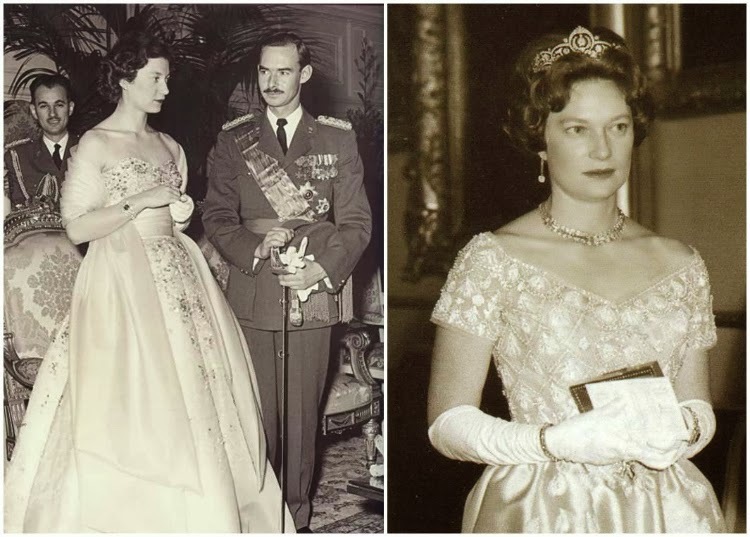 Alongside sapphire and diamonds earrings that are her personal property, Princess Margaretha stepped out wearing her mother's sapphire bracelet as a tiara. Many people suspect that the sapphire brooch the princess wore for her nephew's wedding in 2012 was in fact the central part of the bracelet.